This Oriental tapestry depicts the "Oriental Bamboo" spiraling up towards heaven. The bamboo is a symbol of longevity in Chinese culture and has a place in many parts of Asian culture. Unusual in its structure and exceptionally fast in their growth, the bamboo is one of the plants in the group known as the "Three Friends in Winter" in Japan due to their ability to thrive even in winter. In this tapestry, a golden branch of bamboo is seen with an almost shimmering and iridescent background that compliments the texture of the bamboo leaves perfectly. The use of color in this tapestry is a play on light and color with green of the bamboo contrasting with the background colors most cohesively. The effect of creating these reflective and variegated lighting in the one piece is exceptional. 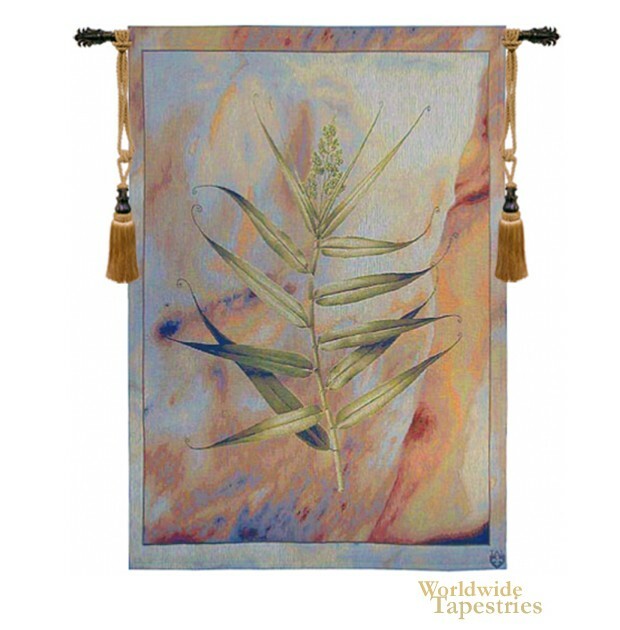 This Oriental tapestry "Oriental Bamboo" is backed with a lining and has a tunnel for easy hanging. Note: tapestry rod and tassels if pictured, are not included in the price.